"I believe the program has been a great success for our school. 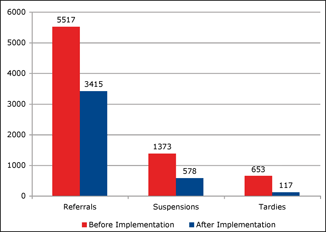 Our referral numbers decreased dramatically, tardies decreased, and there was an overall increase in participation among teachers in the hallways between class periods...Having teachers put forth their opinions and thoughts on how we handle school procedures has given them a sense of ownership in helping create a safe/civil environment for our students where learning can take place." 68% of students qualify for the Free/Reduced Lunch Program. 14% of students receive Special Education Services. We had two girls who came into the office and stated that they were going to fight, but everywhere they looked, they saw teachers—there was no place to fight!